Wild Mood Swings is back for another all-night, all-mix FREE DJ party in Shibuya. It's on a Tuesday, the day before a national holiday. We will play an unpredicatable mix of different tunes, aimed to bake your brain into a cake of catharsis! Join the emotional rollercoaster of love, hate, joy, lust and delirium! 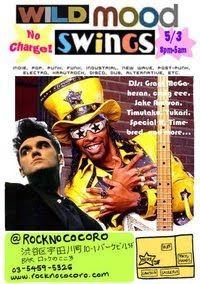 From 8pm to 5am at Rock No Cocoro. Details on Tokyo Gig Guide. 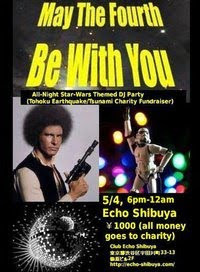 Celebrate International Star Wars Day at this groovy fundraiser for the Tohoku earthquake/tsunami appeal! Drink, chat, and dance to an eclectic mix of tunes with a broad space/sci-fi theme. It's 1000yen to get in, but all proceeds will be donated to charity, so you can drink and dance with a warm glow of philanthropic pride. Come in a group or (Han) solo. The party is on a Wednesday, in the middle of Golden Week, so the next day's a holiday. May the Fourth Be with You! 6pm to Midnight at Echo in Shibuya. This easter Friday (April 22nd), come down down to Gamuso for the 6th edition of Farm Party organised by Tokyo Gig Guide. Guest performers will be N'toko, Akane Hosaka and ヤング・フラッテリィズ, plus Farm Party house band Abikyokan and DJs. We are pleased to have Slovenian electro rapper N'toko take over the mic and sampler on the Gamuso stage. Everyone enjoyed the blipping bleeping melodies of Akane Hosaka when she played at Farm Party #2 a year ago, so she is back for another explosion of electronica and puppet cuteness. Causing a stir on the Tokyo avant-disco scene is ヤング・フラッテリィズ, two guys on synth and dance beats, and an odd frontman who is sure to make creative use of the Gamuso live space. Abikyokan with its members from 4 continents will be bringing their new-wave avant-pop synth-rock sounds to start proceedings. Shibuya-kei aficionado DJ 810 aka Patrick from Chipple, Tokyo's Coolest Sound and Tokyo Recohan. Indie rocker Timutaku from Alternative Current. Grant McGaheran and craig eee from Abikyokan. Throughout the night, craig eee will be providing visual projections. The gig on Tokyo Gig Guide. On Friday, artists who released the "Nihon Kizuna" benefit album the week after the quake are having a party in Shinjuku to celebrate raising over $30,000 for earthquake and tsunami victims. The album features electronic and hip-hop tracks from over 40 international artists -- plus a bonus album with 34 tracks! Harnessing the power of Twitter and social media, the album was put together in a week by an international group of DJs and a journalist here in Tokyo who wanted to do something to help the victims. Artists include Kode 9, Kuedo, Rudi Zygadlo, Broken Haze, Circulations Records, All City Records, Daisuke Tanabe, Yosi Horikawa, XLII, Memory 9, Ninja Tune, Kid Kanevil, Om Unit, Paul White, Illum Sphere, One Handed Music, BD1982, Fink, Emika, Mux Mool, Ernest Gonzales, Paper Tiger, Sesped, Jay Scarlett, Elliott Yorke (Royalty), Kan Sano, Onra and many more. It's really a great deal -- get some cutting-edge music (for me, a horizon-expanding trip out of my usual rock music comfort zone) and know the money you paid for it is going to an urgent cause. The party on Friday is free, but they will take donations for the Red Cross. So come out, have a good time, say hello and listen to some great music for a good cause! Oh and buy the album here!